We have 3 really interesting events coming up here at the Teacher Training Centre. All are connected to teacher development, all have fantastic teacher trainers involved, and all come with free goodies from our partners! Summer is a time to unwind and relax after a tough school year, but it is also a time to reflect on our teaching and think ahead to how we want to develop next year (Dave is the head of the TTC and published his teaching self-reflection here). So why not share your experiences with other teachers and get some fresh input at the same time? The MCT is written and delivered by the team of experienced Teacher Trainers we have here at ILC IH Brno and is supported by Oxford University Press and Macmillan Publishing. There are courses in July and August, so they will fit in with your summer holidays and get you ready for a new school year. On Wednesday 26th August ILC IH Brno is very proud to be hosting two seminars for Macmillan publishing. Presented by Martin Jelinek they are focused on the requirements of business students and a refreshing and realistic way to approach grammar teaching. What do corporate students really want to do in their classes? Learn about a new global approach in business. Get new ideas for your teaching which are based on real life situations, everyday business scenarios and functional language in a business context. Get ready for the new school year! structure more meaningful and therefore easier to understand, produce and retain. Following on from the fantastic success of the first ILC IH Brno Young Ones Conference last October, we are delighted to announce a sequel. In true Hollywood style we are going to give you all something that is the same, but also different.Featuring all your favourite stars from before, including Anette Igel, Kylie Malinowski, Mat Smith, and Sarka Cox, but with a whole bunch of new ideas and activities for you to take-away and use in your classes.We’ll be covering all of the age ranges from the wee little ones through pre-teens and teens all the way up to maturitni students. We are also going to have some sessions on teaching German. So there really is something for everyone. But unlike Hollywood, where after a great original the sequel always disappoints, this sequel is going to be even better than the first! Here at ILC IH Brno, today is the last day of school for most of our classes, but I know many of you will still be going until the end of the month – don’t worry it’s only a few more weeks until we all get some well-earned rest. And because it is the end of the school year all our teachers write a short self-reflection. They think about what their strengths are, what they have done to improve and what they would like to do going forward. I thought I might share mine here. One downside to being the DOS (Director of Studies) is that I spend less time teaching than I might like – that is actually something I plan on changing for next year, I’d like to be doing a bit more regular teaching than I do at the moment. Having said that I was very lucky with the classes I did have this year, an Intermediate class of just 5 students and a 1-2-1 with a 14 year-old boy. All of them committed students who were, usually, on time and prepared, usually, to do their homework. In the Intermediate class one of the things we spent time working on was pronunciation, in particular creating chunks of connected speech. It was often challenging for me as I had never done this before and I am no expert on the subject, but by doing a little bit of practice with it most weeks and encouraging the students to listen for it in the listening tasks, my speech, or whenever they heard English, all of them developed a bit more of a natural rhythm. The biggest issue was the fact we were in a classroom with a blackboard and chalk. On the upside it really got me thinking about what needed to go on the board and how to keep that brief and clear (I don’t like writing with chalk and the students didn’t like looking at it either). It meant as a group we did quite a lot of verbal recapping and prompting, which was usually both asked for and given by the students themselves. So maybe the blackboard wasn’t that much of a problem after all! With the teenager – in fact with all the teens classes I ended up teaching this year as I did quite a few cover lessons – it was really nice to connect and get an alternative perspective on things than just my old teacher’s view. Again pronunciation was something we worked on more than I would have done four or five years ago. Here the problem was to do with articulating the difference between voiced and unvoiced consonants at the end of words. He told me his favourite game was “World of Tongues” (but why not – he is 14 after all) when he meant “World of Tanks”. What I found difficult was that when making the sound in isolation he had few problems, but the longer the utterance the less pronounced the difference between voiced and unvoiced became. I am going to try and do some reading about this over the summer as it also came up in another teens class (“My father is CEO of Lidl company” when he meant “a little company”). As for next year, apart from continuing my progress with teaching pronunciation, the first thing is just to do some more teaching. Maybe a teens or post-maturitní (post-high school) class, and then I want to make sure I am planning clear coherent lessons as sometimes with time pressures I don’t spend enough time getting lessons ready. But I also want to make sure I am focusing on the students and what they want, need and respond to. My other summer reading is connected to learner autonomy and a post-maturitní class would be perfect to try out some new ideas. Here in Czech most schools I know give their students some kind of end-of-year test, which means we teachers need to prepare some revision lessons – and sometime the test itself (whether testing has any value and what that value is are interesting questions that I’m not going to talk about today but for a good discussion on the topic there is this blog post and a full comments section from Scott Thornbury). So, seeing as I had a class today that had a revision lesson, I thought I would share my favourite way of re-covering some of things we have already done this semester. But first of all there are a couple of problems with revision lessons to think about. 1. Students move at different speeds, some have missed lessons, some haven’t always done their homework and some just weren’t having a good day. 2. This class is shared with another teacher who has covered half the material (and I missed a lesson which meant they had a third teacher). Even with the best kept class register I still can’t be sure of exactly what happened in a lesson. 3. Time. If we have covered the book, and used the Teacher’s book, and set them homework from the workbook, and given them the links to any extra on-line material (this class are really good at doing all of this stuff, which is one reason I love teaching them, they all want to learn), then what on earth am I going to use for revision? I’m busy, I don’t have hours and hours to write a bunch of material. So I don’t write a bunch of material. I re-use the old material. First of all I talk to them about the areas they’d like to look at, and add a couple I know they need to work on ( e.g. because it was hard for them first time and/or I know it’s in the test). Then I get the workbook and copy some pages – the workbook is exclusively for homework, they all have a key and it only gets talked about in class when students have had problems. So the material here is relevant, as in they covered it, but the answers are not fixed in their minds the same way a word that came up in a speaking activity might be. I cut up the individual activities and write the language point they cover on the top. These mini-exercises I scatter on the desks round the room and let students choose what they want to practice. I let them take their books and workbooks with them so they can set their own level of challenge for each exercise. They have the key so they only call on me for help. Walking around I monitor and do little one-to-one sessions with them – checking why they chose an answer, getting them to give me synonyms, asking them how they have to change a sentence to make an alternative answer work, etc. We then come back as a group and talk about what was easy and difficult, and do a little peer revision of things they struggled with if possible. This way the students get to focus on what they want to, in their own timeframe but knowing teacher support is there if they need it. At one point, after about an hour of a 90-minute lesson, I asked if they wanted to stop or keep going and they unanimously wanted to carry on. It’s always great when that happens. Mike is one of our YL teachers here at International House Brno and he loves using games with his learners, and regularly makes his own. Mike has just started blogging – his blog is called Teaching Games – and he has kindly allowed us to re-post this great game for prepositions. This is a game for revising prepositions of place with an elementary level class. The game is available for download at the bottom of the page and includes everything needed to print and play. Before playing the game I used a quick matching activity to revise the vocabulary from the previous lesson. Students worked in pairs to draw lines and match the words to the pictures. This could also be used to pre-teach the vocabulary before playing the game. 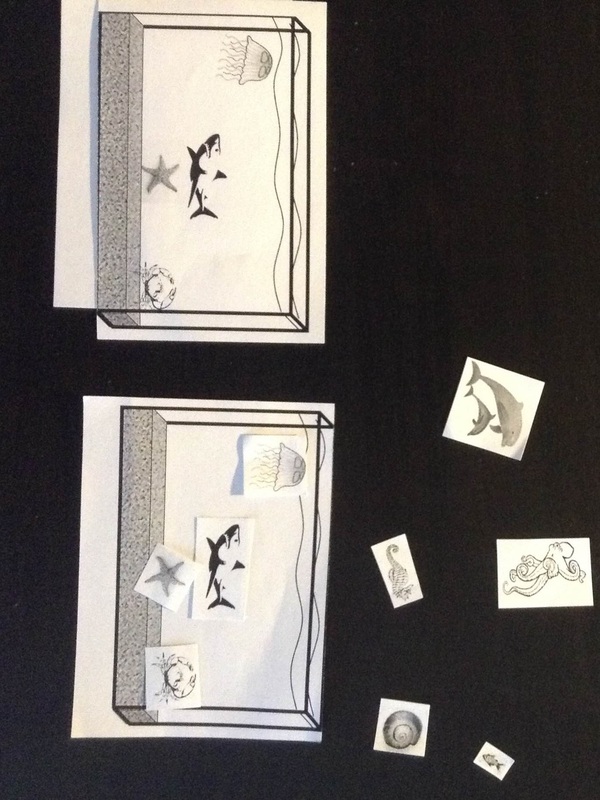 Working in pairs, students are given the aquarium picture cards and asked to spread them out on the desk in front of them. They are then given the stack of description cards face down. 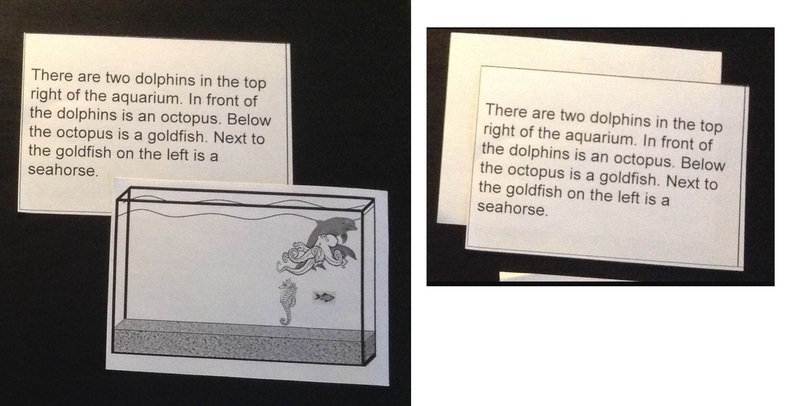 Students take the first description card, read it together and then find the aquarium picture that matches the description. They put the matched cards to one side. Students continue to match the descriptions to the pictures while the teacher monitors. If a match is correct the teacher should flip the picture cards under their descriptions so they are hidden, face down. When the students have finished they will have nine description cards in front of them with each card’s matching picture face down underneath. This is the first half of the game. It acts as a quick ‘reading for gist’ activity as the students are able to differentiate between the pictures based on vocabulary, positioning and the process of elimination. 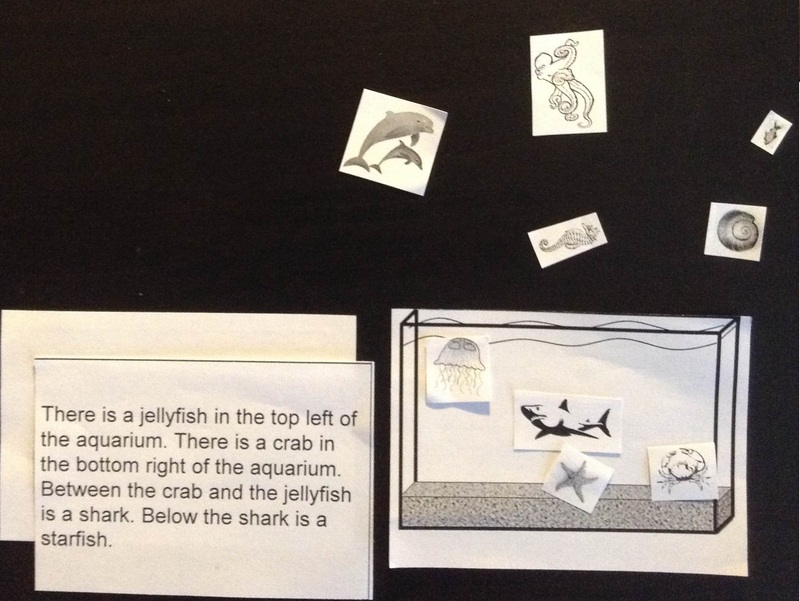 Once the students have finished matching up the descriptions they are given their own aquarium card with cut-out sea-life. 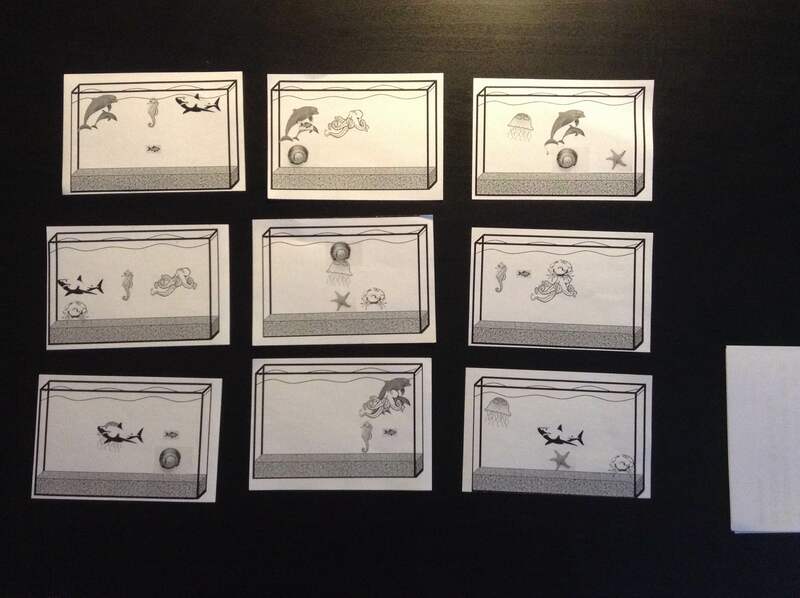 They will use these cards to recreate the aquarium pictures from the first part of the game by following the descriptions. This is the core part of the game. Students re-read the first description and follow the directions on the card, moving the pictures into place. When they think they have the correct answer they can check the picture underneath. Students continue until they complete all of the cards. Now that they have to follow the descriptions exactly, the process is slower and requires a greater level of cooperation than the first reading task. Early finishers are given paper to write their own descriptions for the game. 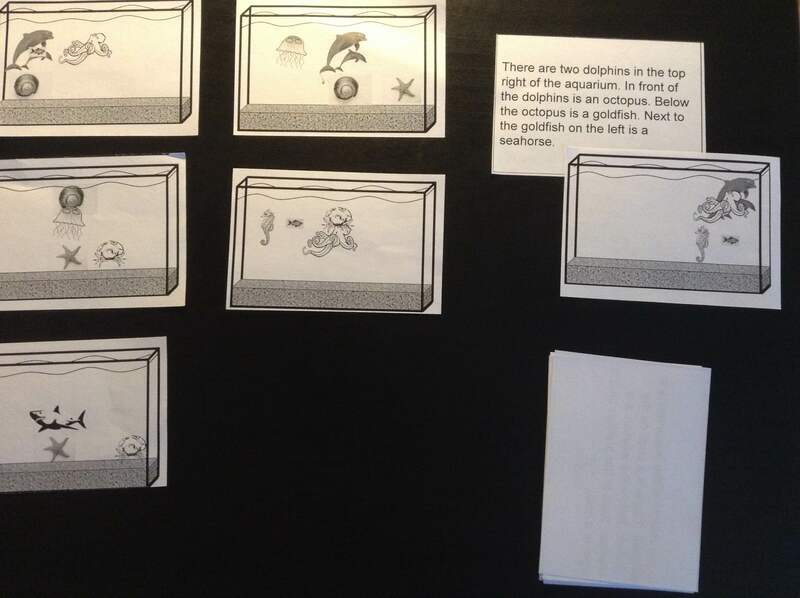 These can be used for a follow up activity, as students read their descriptions and their partners use the aquarium cards to match the description. 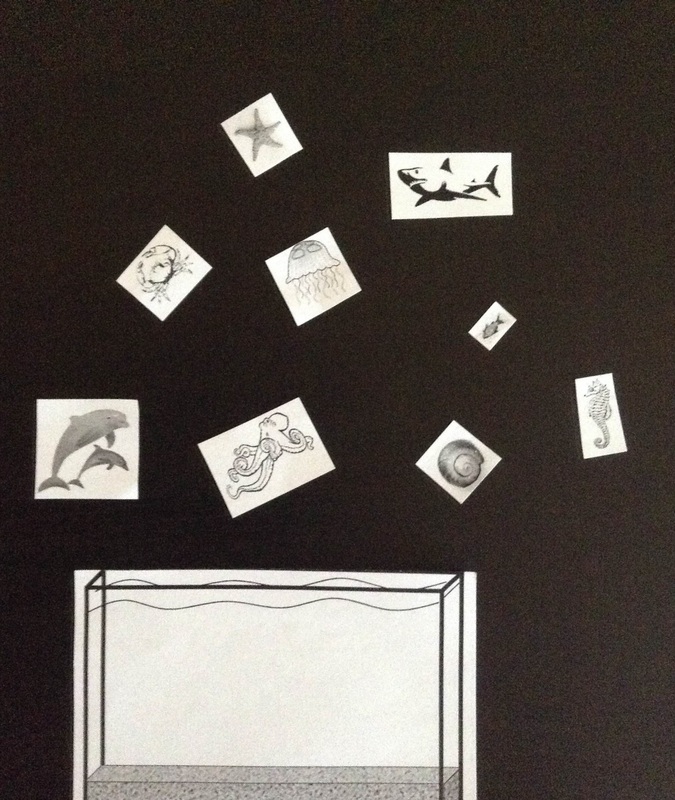 As another follow up, students could draw their own version of an aquarium and write a description using the language structures from the game. I used this game in two lessons yesterday and students really enjoyed it. I was cautious about using a game with a lot of reading with younger students, but the puzzle element kept them motivated throughout. All of the students wanted to keep playing until they were finished. They also seemed to enjoy the tactile nature of moving the small pictures into place. A couple of the boys preferred to take turns being in charge, rather than fully cooperating, but overall it was an absolute success and a game I will be returning to in the future. To download the two Powerpoint documents click here and click here. 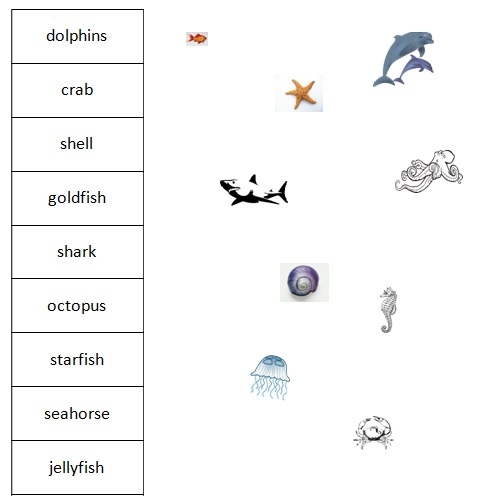 The vocab matching activity can be copied directly from the first image. The vocabulary used in the descriptions of the game include: middle, top left, top right, bottom left, bottom right, on, under, above, next to, between, in front of and behind. Pictures were taken from pixabay.com, which has a searchable selection of public domain images that can be used without attribution. Spring is really here and summer is on the way. To celebrate this exciting time of year we would like to offer you a 10% discount off one of our summer Methodology Courses for Teachers (MCT) if you register in May. 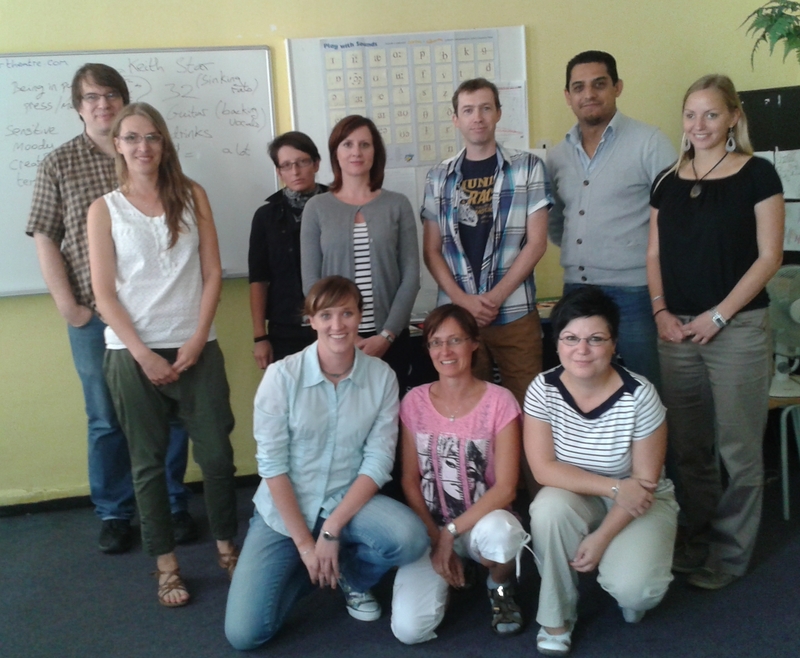 The MCT is written and delivered by the team of experienced Teacher Trainers we have here at ILC IH Brno and is supported by Oxford University Press and Macmillan Publishing. There are courses in July and August, so they will fit in with your summer holidays and get you ready for a new school year. Just contact the school to register for the MCT before the end of May – no deposit required – and you will receive a 10% discount off the course of your choice. We are very sorry but this discount cannot be combined with any other offer.